In last month’s issue I proposed that radiofrequency/microwave radiation (RF/MW) of the earth has played a major role in the unprecedented rise in the incidence of cancer and neuromuscular diseases over the past fifty years. I explained why studies published in major United States’ medical journals may not reflect the actual risks of non-ionizing radiation. Since, as one scientist put it, the only location that is currently free of RF/MW is the back side of the moon, it is no longer possible to do population studies to determine whether exposure to RF/MW causes an increase in certain diseases. If there is no safe level of RF/MW exposure we cannot rely upon studies that use various exposure levels to demonstrate an adverse response. We can only look back at studies performed or data collected prior to the advent of the ubiquitous FM and microwave radiation of our planet. One of the factors affecting the outcome of so-called scientific studies is investigator bias. I know of no better example of this than that shown in analyses of childhood cancer statistics surrounding the Sutro tower in San Francisco. The Sutro tower broadcasts radio and television signals to the San Francisco Bay area. Data on childhood cancer within a seven mile radius of the tower was collected between 1973 and 1988. Two separate analyses of the data have been published. In 1993, statisticians at the University of California at Berkley reported their analysis of the Sutro Tower data. They concluded, “the patterns of the major childhood cancers are essentially random with respect to the point source.” In other words, they found no correlation between the location of a child’s home relative to the tower and the chance of the child developing cancer. The Berkley article was published in the journal Social Science Medicine and is contained in the National Library of Medicine database. One of the analyses performed by Dr. Cherry compared the incidence of childhood cancer with the child’s exposure to radio/television wave radiation. Since waves have a peak and a trough, individual houses receive either a high or low level of exposure. Figure 2 compares the incidence of childhood cancer with the level of non-ionizing radiation in each location. The correlation is undeniable. Because Dr. Cherry’s work was performed and published in New Zealand, where he was Associate Professor of Environmental Health at Lincoln University, it has been almost universally overlooked in the United States. Nevertheless, Dr. Cherry was arguably the world’s foremost expert on electromagnetic radiation and human health. His strong background in physics, biophysics, meteorology, and environmental epidemiology made him uniquely suited to evaluate the impact of RF/MW radiation. In 2002 Dr Cherry was awarded the Royal Honour of Officer of New Zealand Order of Merit for his services to science, education, and community, including his research and teaching work on environmental epidemiology and the health effects of electromagnetic radiation. Others have found similar increases in cancer surrounding RF/MW antennas. Data collected between 1974 and 1986 confirmed a suspected increase in adult leukemia cases surrounding the Sutton Coldfield television and FM radio transmitter in the West Highlands, England. The incidence of skin cancer and bladder cancer was also shown to be higher in locations nearer to the tower. Data collected from 1972 to 1990 in North Sidney, Australia showed that children living near TV towers were almost twice as likely to die of leukemia as children at more distant locations. An analysis of data from an area surrounding a transmitter in Rome, Italy produced a similar result. Even more telling is the research of Orjan Hallberg and Olle Johansson of the Karolinska Institute in Stockholm, Sweden. Hallberg and Johansson have published several papers looking at disease incidence before and after the introduction of FM radio broadcasting. As is typical of research that is critical to RF/MW technology, their work has been published in small journals such as the Journal of Australian College of Nutrition and Environmental Medicine. Because these publications are not included in the United States’ National Library of Medicine database, few people are aware of their findings. Dr. Johansson, a dermatologist, was intrigued by the sharp rise in malignant melanoma incidence, which began in the mid-twentieth century. While experts espoused the theory that the increase was due to greater sun exposure, Johansson was skeptical. He and Hallberg examined the correlation between melanoma and increased sun exposure of the Swedish population. They were able to do this because residents of Sweden must travel to the beaches of Southern Europe to swim and sunbathe. The availability to do so was limited until charter air flights became available in the 1960s. Hallberg and Johansson found that the number of melanoma deaths and new diagnoses of the disease began to rise well before Swedes began traveling to sunny climes. Having failed to find a correlation between increased sun exposure and malignant melanoma they looked for other possible explanations. They discovered that the death rate and incidence of the disease rose in concert with the rise in FM broadcasting in Sweden. 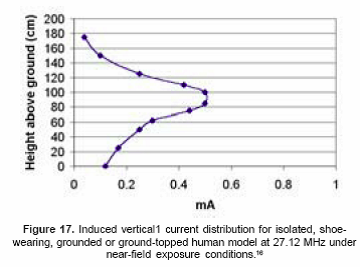 Figure 3 is from the Hallberg and Johansson paper, “Malignant Melanoma of the Skin – Not a Sunshine Story.” It shows that the death rate jumped immediately following the introduction of FM broadcasts, suggesting that exposure to radio waves adversely affected the body’s ability to respond to and repair damaged cells. New cases began to be diagnosed several years later, suggesting that the FM waves not only impaired the body’s response to the cancer, but caused damage that predisposed to the development of the disease. 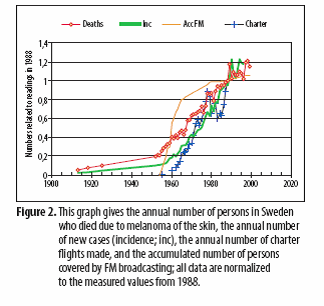 The graph also shows that the rise in charter flights from Sweden followed, rather than preceded, the melanoma outbreak. Having demonstrated a strong correlation between melanoma and FM broadcasts in Sweden they looked at the relationship between FM broadcasting and malignant melanoma in other countries. They found the same correlation. One of the observations that caused Johansson to question the theory that malignant melanomas are caused by sun exposure is the fact that they occur most commonly on the trunk of the body, which typically has less sun exposure than the face, neck, and the extremities. This phenomenon has baffled physicians ever since the sun exposure theory was first proposed. Some have even suggested that occasional exposing one’s skin to the sun is more likely to trigger a melanoma than frequent sun exposure. Hallberg and Johansson compared the distribution of malignant melanoma lesions on the body to the strength of the electric current generated in the body by FM radio waves. 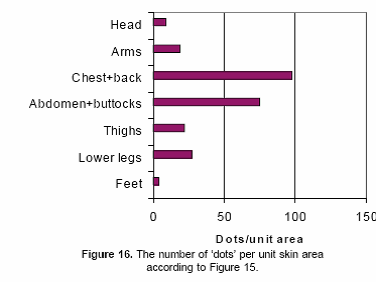 They discovered that the distribution of melanoma and the distribution current are a perfect match (Figures 4 & 5). In 2002 Hallberg and Johansson released a study titled, “Cancer Trends During the 20th Century.” In the paper they show that mortality rates for bladder, prostate, colon, breast and lung cancers in the United States, Sweden and other countries, closely parallel that of malignant melanoma. They further demonstrate that these cancers have increased and decreased depending upon the amount of exposure to radio waves during the past hundred years. When FM broadcasting increased in a given location, so did cancer rates. In contrast; when radio broadcasting decreased, so did the incidence of cancer. Incredibly, they found that exposure to radio waves was as significant a factor in the development of lung cancer as cigarette smoking! Given the correlations between FM broadcasting and cancer it is alarming to consider a study done in Salzburg, Austria. It found that the RF/MW radiation levels had increased over 100 fold following the installation of a cellular communication network. When short-term studies failed to show an increased risk of brain tumors with mobile phone use, representatives of wireless industries, medical organizations, and governmental agencies were quick to proclaim that the devices were safe. Unfortunately, time is not proving that stance to be correct. Two studies released in the past year have shown a significant increase in tumors related to cell phone use. The first showed an increase in non-malignant tumors of the nerve that carries sounds from the ear to the brain (acoustic neuromas) on the side used to listen to the phone. The second showed an increase in gliomas, a type of brain cancer. In both instances, the rise in tumor incidence did not appear until individuals had been using a cellular telephone for ten years. As striking as the statistical correlations are (well outside the realm of chance), it is important to determine whether a mechanism exists by which RF/MW radiation could trigger the appearance of cancer in the human body. Research has demonstrated that a mechanism does exist. In 1995 a landmark study conducted by Doctors Henry Lai and N. P. Singh at the University of Washington’s Center for Bioengineering demonstrated that a single 2 hour exposure to microwave radiation lower than the government’s “safe” level caused breaks in DNA. This was highly significant, since DNA damage is one of the primary triggers for cancer development. Unfortunately, Lai and Singh could not obtain funding to pursue their research into RF/MW effects on DNA. Following the publication of Lai and Singh’s findings another researcher, Dr. Jerry Phillips, was given a grant by Motorola to perform another experiment on the effects of cellular telephone radiation on animals. Dr. Phillips agreed. It important to understand that Dr. Singh is one of the world’s leading experts in detection of DNA damage. He developed a technique known as the “comet assay” to identify breaks in DNA strands. His assay has been used to show DNA damage in a wide range of conditions including chemicals and high frequency radiation. In preparation for his research Dr. Phillips sent two assistants to Washington to learn how to perform Dr. Singh’s comet assay. Only after duplicating Singh’s results in other areas did Phillips conduct his experiment on microwave exposure and DNA damage. Dr. Phillip’s results were consistent with those of Lai and Singh. Motorola executives encouraged to hold off on publishing his data, but Phillips refused. He was unable to obtain funding for further research. Other laboratories subsequently reported that microwave radiation did not cause DNA damage, but they did not use Dr. Singh’s sensitive comet assay technology. Finally, in 2004, twelve research institutions located in seven European countries reported that they had proven conclusively that low level exposure to RF/MW radiation causes genetic damage. Known as the REFLEX study, DNA damage and a change in the action of numerous genes and proteins were shown to occur with great certainty. While their work was done on living cells in the laboratory it has great implications on what might be expected to occur when whole organisms are exposed to RF/MV radiation. In September 2005, Dr. Zhengping Xu of the Zhejiang University School of Medicine reported that his laboratory had also found a significant increase in DNA damage in cells exposed to RF/MW radiation. While the prevailing attitude in the United States is that RF/MW radiation poses no risk to human health, increasing numbers of scientists disagree. In 1998 a group of scientists adopted the Vienna Resolution, which stated in part, “biological effects from low intensity [RFR] exposures are scientifically established.” The Salzburg resolution of 2000 stated that there is no safe exposure level for RF/MW radiation. The Stewart report that same year urged the United Kingdom to use caution in expansion of wireless technologies until more scientific evidence was available. The Catania Resolution of 2002 also urged caution. In 2005 the United Kingdom National Radiation Protection Board issued a warning that no child under the age of 8 should use a cell phone. The report also listed concerns about the location of cellular telephone towers. In September 2006, the International Commission for Electromagnetic Safety (ICEMS) released the Benevento Resolution, which stated that the accumulated evidence points to, “adverse health effects from occupational and public exposures to electric, magnetic and electromagnetic fields (EMF) at current exposure levels.” It was signed by 31 leading environmental health scientists from around the world.